Above: Entrance of the Künstlerhaus Mousonturm. Below: The theater café. All images: Unless otherwise noted, photo Masahiro Hasunuma. Where is this? 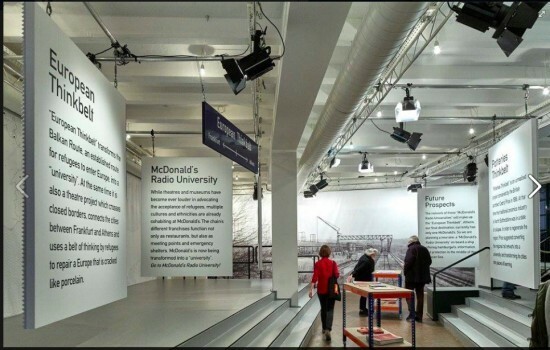 Most people would immediately assume it is McDonald’s, but closer examination reveals a subtle difference: the “M” icon is angular, not rounded, and the sign reads “McDonald’s Radio University.” This is actually the café in the Künstlerhaus Mousonturm, the publicly funded theater in Frankfurt that is a leader of the European free scene. The theater is located amid the calm of one of Frankfurt’s most prestigious residential areas. The theater’s café has been part of the local scenery since its establishment 30 years ago, and its sudden change into a “McDonald’s” restaurant has caused a mixture of confusion and curiosity among theatergoers and local residents alike. This pseudo-McDonald’s opened on March 2 of this year. 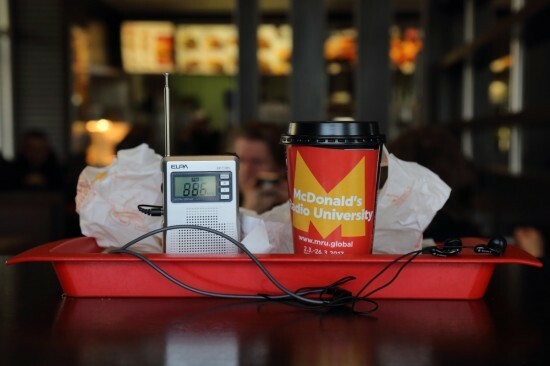 The base for a series of theatrical projects entitled McDonald’s Radio University, the café serves as a place for both providing an overview of the entire project and for taking virtual lectures. The actual lectures take place in seven real McDonald’s restaurants across Frankfurt that have been designated as “campuses.” For three weeks from March 2 to March 26, anybody can listen to the McDonald’s Radio University lectures for free by ordering lectures along with hamburgers and French fries at the restaurant counters. There are two to three lectures per day, provided in either English or German by 15 professors – all people considered to be “refugees” who have come to Germany in recent years from Afghanistan, Syria, Pakistan, Ghana, Burkina Faso, Eritrea, and Iran. A total of 15 courses are available: music, philosophy, architecture, urban research, biology, natural science, literature, cooking, international affairs, risk management, sports science, journalism, media studies, accounting, and English. 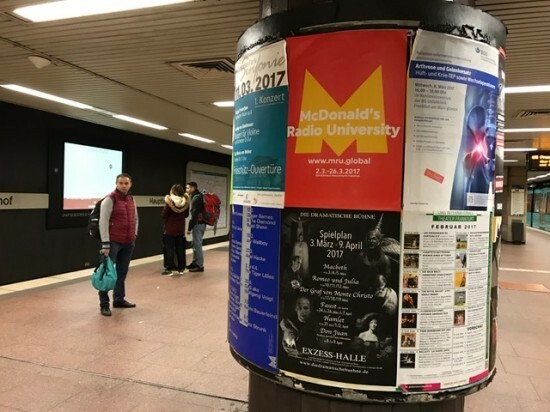 The logo and poster for McDonald’s Radio University spread throughout the city. McDonald’s Radio University was launched by Akira Takayama (PortB), an associate artist of the Künstlerhaus Mousonturm. The pseudo-McDonald’s icon appears on all of the theater’s PR material, such as posters, pamphlets, and stickers, spreading the symbol throughout the city. For those in the know in the local culture scene, it is apparent that this fake “M” is the logo of the Künstlerhaus Mousonturm and that there is a Japanese artist who has been stirring buzz among the Frankfurt media from behind the scenes. Despite this, the pseudo-McDonald’s icon’s proliferation in public areas has caused indignation among the sensible elite who firmly believe in the social value of theaters and museums. To these people, McDonald’s is nothing but a symbol of global capitalism that destroys regional identity and exploits workers. McDonald’s is a prime example of unhealthy fast food, and it is also a dangerous place where the poor, immigrants and youngsters hang out for lack of anywhere else to go, which is conducive to crime. It is not uncommon to come across people who were raised from childhood with values that reject McDonald’s and have therefore never even stepped into a McDonald’s restaurant. Takayama’s aim in attempting to lure theatergoers to such places is obvious: “McDonald’s is the restaurant that has accepted the most immigrants and refugees in Europe, both as workers and customers, and it has created a model of integration by doing so,” he explains. While the theaters and museums of Europe may advocate acceptance of immigrants and refugees in the name of cultural tolerance, only the white elite are actually found at performances and exhibitions. In contrast, McDonald’s has realized multicultural/multiracial coexistence in a specific form. Its function is not only that of a restaurant that provides affordable meals, but also that of a meeting place or shelter for those who have no secure place in society. Considering the evident class-consciousness and communal division of Europe, are there any other spaces where so many races, ethnicities, religions and generations can coexist both as workers and customers? To say the least, theaters and museums are not among them, even if they may advocate the ideals of multiculturalism. 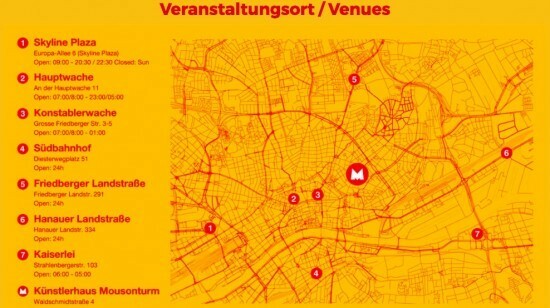 Map of the seven restaurants in Frankfurt where McDonald’s Radio University is taking place. 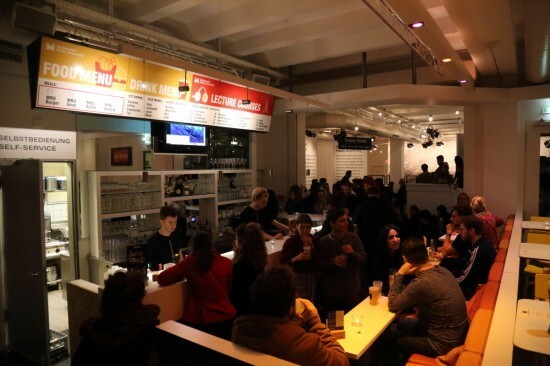 After checking the lecture schedule on the syllabus, the audience goes to one of the seven McDonald’s restaurants in Frankfurt where the lectures are held. When they order a lecture at the counter, as they would order French fries or hamburgers, a portable radio and pair of earphones are provided on a tray. Tuning into 88.6MHz, they will then hear an announcement: “This is McDonald’s Radio University. The lecture is about to begin. Please stay tuned.” Although there are other customers among the crowd who are also wearing earphones attached to portable radios on their trays, the “students” never exchange words with each other. At the starting time, the announcement is replaced by the voice of the “professor.” While the “professor” is supposedly delivering the lecture in real time from somewhere within the McDonald’s, it is impossible to pin down who it is. All the audience can do is imagine how the “professor” looks based on the voice and the content of the lecture. McDonald’s restaurant during a McDonald’s Radio University lecture. 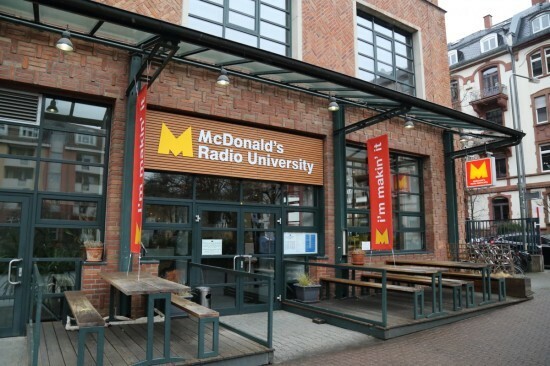 The 15 professors teaching at McDonald’s Radio University on this occasion lived ordinary lives in their home countries until a few years ago. Some of them were even people of high social status, such as government officials, university professors or professional athletes. However, their lectures gradually reveal that they are refugees who escaped various perils and wars by crossing the Mediterranean on small boats and walking to Frankfurt. These texts were written by the refugees themselves. Takayama and the theater staff took more than half a year to hold numerous meetings with the refugees and establish trust, asking about their personal experiences and areas of specialty. Following that, the theater’s dramaturge and Tatsuki Hayashi joined in to repeatedly revise the texts, and it was after this that the texts were finally completed. The texts are written in extremely simple English or German and read slowly. They never explain the specifics regarding how the authors became refugees, let alone emphasize tragic episodes. They simply cast light on the lives and pasts of the “professors” while they calmly give details of their skills and specialties. In listening to their narratives, the “students” themselves also experience a time of “learning” in solitude without communicating with anybody else. Even after the lectures end, some students remain silent in the McDonald’s restaurants with their earphones still on. This is perhaps similar to the feeling after the performance of a drama, when you wish to stay seated in the theater without talking to anybody. 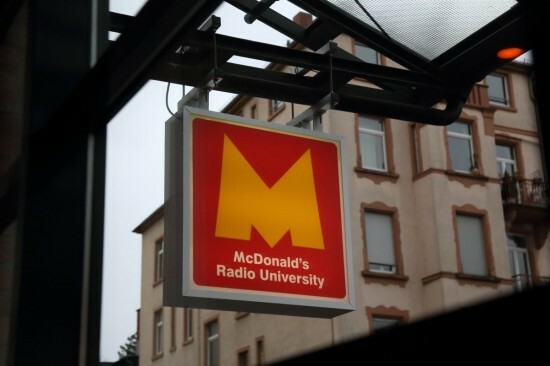 McDonald’s Radio University is actually only a part of Takayama’s plans, the first step of his broader scheme: starting from Frankfurt and retracing the Balkan route the refugees took back to Athens, he plans to connect Europe vertically through McDonald’s Radio University events. This longitudinal crossing of Europe is called European Thinkbelt, an alternative title in parallel to McDonald’s Radio University. The title pays homage to the Potteries Thinkbelt (1), an unrealized project proposed in 1966 by the British architect Cedric Price (1934-2003). An exhibition produced by Keigo Kobayashi, an architect who began closely collaborating with Takayama for this project, is being displayed in the Künstlerhaus Mousonturm’s foyer as a preview of the enormous scheme. Above: European Thinkbelt exhibition, designed and directed by Keigo Kobayashi. Photo Jörg Baumann. Below: Display of the Balkan route to be retraced by European Thinkbelt. Takayama learned about Cedric Price through an essay written by Arata Isozaki (2), and was profoundly inspired by Price’s idea of reversing negative values into positive values through architectural interventions. This is not merely a matter of creating buildings, but the presentation of solutions to realistic problems from the perspective of architecture, a completely separate field. This is a social experiment that actually transforms society itself. It even has the potential to go beyond being just an experiment to become a social enterprise with actual benefits. Takayama wants European Thinkbelt to be not just a theatrical project produced by himself, but a social experiment spanning across Europe, and a social enterprise that actually benefits the refugees traveling there as well. Five cities are specifically listed in his plans: Frankfurt (Germany), Vienna (Austria), Budapest (Hungary), Belgrade (Serbia), and Athens (Greece). Connecting these cities highlights the Balkan route that many refugees followed. At least in these five cities, McDonald’s restaurants will be transformed into McDonald’s Radio University campuses, welcoming as professors refugees who took the route, and turning McDonald’s into a place for learning. In Athens, where only two McDonald’s restaurants exist, a ship floating on the Aegean Sea will be opened as a third McDonald’s. The McDonald’s ship will go up the Danube River and revisit Belgrade, Budapest and Vienna before entering the Main River via a canal and returning to Frankfurt, stopping at the port in front of the European Central Bank headquarters. The Künstlerhaus Mousonturm is nearby. 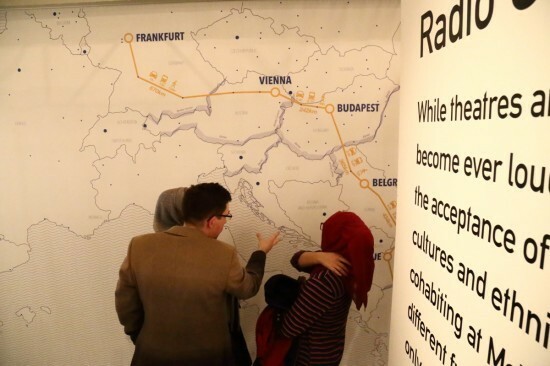 The thinkbelt that emerges from connecting the cities in this relay of McDonald’s Radio University projects from Frankfurt to Athens is, in the most literal sense, a “belt” of “thought” that casts light on the hidden aspects of European society. This spectacular project will be realized over the next three years in partnership with theaters and initiatives in each city. The refugee crisis is becoming a critical issue worldwide, and the European art scene considers artistic responses toward social issues an obligation. Turning refugees’ tragedies into scripts and acting them out or placing refugees onstage as survivors with overwhelming stories to tell are not the only responses theater can provide. By physically retracing the long path the refugees took through Europe, and transforming it into a place of learning/thinking, Takayama’s theater reverses the relations between those who teach and those who learn, or those who give shelter and those who receive it, evolving into a “theater of the road” that will be established in the future. Translated from the Japanese by Azusa Suga. Akira Takayama founded Port B in 2002. He develops projects that take theater outside its existing frameworks to collaboratively connect with other media. He works to update what he calls the “architecture of theater” by expanding the conventions of theater and the audience in society and urban space. His audience-centered work is an attempt to create theater beyond the physical theater space as a new social platform and function. In recent years he has been developing work within a wide range of fields, including tourism, urban planning, art, literature, fashion and mass media, using ideas from theater to cultivate new possibilities across a variety of mediums and genres. In 2014 Akira Takayama/Port B and Künstlerhaus Mousonturm developed and presented EVACUATE, for which more than 30 rail-network stations across the Rhein-Main Region were turned into starting points for individual journeys to different social communities and theatrical ready-mades. Chiaki Soma is an art producer based in Tokyo. From 2009 to 2013 she was the Founding Program Director of Festival/Tokyo, Japan’s leading performing arts festival. From 2006 to 2010 she was also the Founding Director of Steep Slope Studio in Yokohama. In 2014 she established Arts Commons Tokyo, a non-profit organization. In 2015, she received the Chevalier de L’Ordre des Arts et des Lettres. Since 2016, she has been a Specially Appointed Associate Professor in the College of Contemporary Psychology, Body Expression and Cinematic Arts, Graduate School of Contemporary Psychology at Rikkyo University, Tokyo. (1) The Potteries Thinkbelt is an unrealized plan proposed in 1966 by the British architect Cedric Price (1934-2003). The “Potteries” refers to Northern Staffordshire, one of the centers of pottery production in the UK. The regional industry was stalling, and in order to resurrect it, Price suggested building university research facilities and a residential area there. Instead of conventional university campus structures, university facilities with a total of 20000 students would be spread out to form a belt. While the region was already part of the railroad and highway networks, both means of transportation risked becoming useless to the declining pottery industry. The project would provide new plans for the region and make use of the existing railroad by fitting in a university with a totally new form of knowledge exchange. Under this plan, classes would be taught in the yards of the stations, so Price designed education facility units that could be transported via railroad and assembled on site. In an era when universities could no longer stand alone as communities, the Potteries Thinkbelt took advantage of the spreading of universities and aimed at mobilizing them. The proposal was to make use of the facilities of a now declining traditional industrial region, creating a new means of regional development and completely transforming the existence of universities at the same time. It was a project that converts pre-existing transportation facilities into universities and turns cities into places of learning. (2) Arata Isozaki, “Cedric Price – Erasing Architecture into the System,” in Disassembling Architecture, Kashima Shuppankai, 1997.